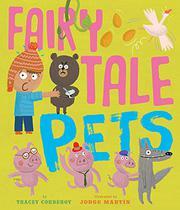 A bevy of fairy-tale creatures descend on a newly minted and totally unprepared petsitter. Young Bob, who wears a Peruvian hat and has freckled, light-brown skin, and his purple dog, Rex, live “on a nice neat hill, in a nice neat house, with neat roses.” But Bob and Rex are “very, very poor.” Since their neighborhood is overrun with pets, they decide to become petsitters. They advertise: “NO PET TOO BIG.” Mistake. With the morning comes their first customer, a little golden-haired, white girl who wants them to look after her baby bear. The bear is a complainer: someone’s been into his porridge, sat in his chair, and slept in his bed—but that’s Rex’s bed, which he breaks. “Ding Dong!” Jack’s goose needs tending, and so do the troll’s three billy goats. Mayhem ensues as Bob and Rex lose—or never gain—control over the lot when three pigs drop by to hand off “Our—um—puppy.” Or wolf, which huffs and puffs and “BLEW THE HOUSE DOWN!!! !” Bob is now homeless as well as poor. He keeps his cool, for he still has the beans. “ ‘I’ll be a gardener!’…What could possibly go wrong?” Corderoy’s thin narrative rests on an appreciation of upside-down slapstick and a knowledge of the tales, and it is fully fueled by the rumbustious illustrations.